AQAL Capital is a single family-office that was originally named Infobahn Angels. It began its activities in 1993 by investing in BayNet World, the first Silicon Valley real estate Internet platform, co-founded by Tom Schulz. BayNet World was followed by Infobahn International GmbH, Infobahn Romania SRL, and Cybernet AG, the first Internet Service Provider that went public on the German Stock Exchange, der Neue Markt. Subsequently, we invested in Penumbra, TeeLiving, Specialties, and many other companies. PSBG is a single-family office focusing on restructuring and company building while integrating sustainability in all its business processes. As active holding PSBG supports its business investments with intensive functional and strategic support. Main investments have been HPI AG fleet management, eprolog AG a long-term and strategic procurement & supply chain management service provider and UBH software development for automation and business solutions. 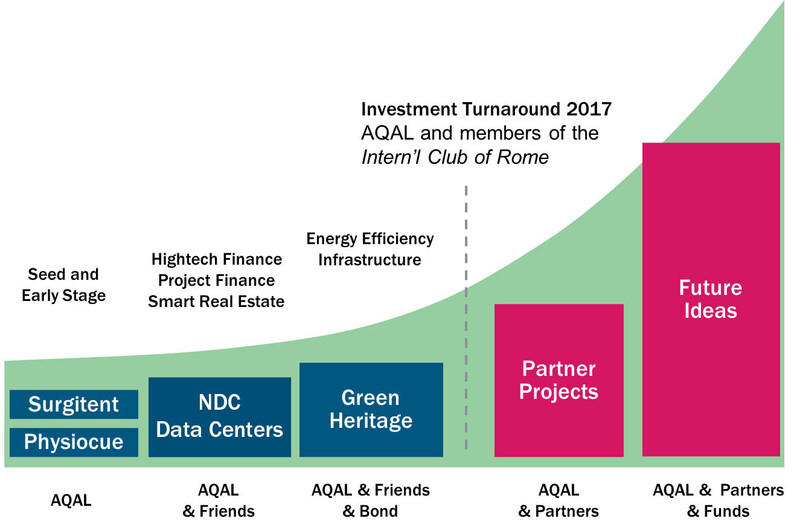 AQAL AG is a Munich-based, exponential-tech holding company that performs direct and indirect investments across multiple stages of a company's investment needs, ranging from early stage to growth stages. We create successful and integrally sustainable (people, planet, profit) companies from the very beginning. We believe we are all looking into a bright and exciting future because we are willing to grow and reinvent ourselves every single day. In this future, a new paradigm in investing, economics, and business is crucial to our survival on this planet. Finance and business are, next to politics, the driving forces of the world economy. Therefore, we are actively participating in the investing world in a conscious manner and feel not only the need to challenge the way investing is currently being performed, but have the responsibility to make it integrally sustainable. In this investment style, high financial returns are inseparable from a high positive impact on the Environment, Social Responsibility, Ethical Corporate Governance (ESG), as well as culture and happiness. We are committed to contribute our share toward the implementation of the Paris Agreement COP21 and the Sustainable Development Goals of the United Nations. We integrate our fiduciary goals with environmental, social, and governance (ESG) commitments and de-risk our investments by creating integrally sustainable organizations. We deploy our capital for optimal, risk-adjusted financial return, and premium integral impact return. We use the Integral Theory to create an integrally sustainable investing landscape. We apply the Theta Model to de-risk our investments and to implement our 6Ps. Which partners will join in the future? Since 1993, our single family-office grew into a multi-family office due to an increasing interest in Integral Investing by like-minded high net-worth individuals. Thus, the AQAL Group was born along with green bonds and other investment vehicles and projects that enable further participation. On October 2017 we officially launched the Investment Turnaround (Investmentwende) as the next paradigm in investing. Today, AQAL is working with additional partners and is already building the Platform to scale Integral Investing. © 2016–2019 AQAL AG — All Rights Reserved.